Genetic modification is met with great skepticism for a variety of reasons by a populace wary of messing with nature. Now, some scientists are planning what seems to be a charm offensive — proposing that genetically modified houseplants could work for their owners, even replacing table lamps, and that trees could double as street lights. Scientists at the University of Tennessee, Knoxville, published a paper suggesting that modifications used on crops could work on domestic plants and warn homeowners about pollutants in the air. The analysis, published in the Journal of Biosciences, described how genetically altered tobacco plants would glow orange under a green light if they came into contact with pathogenic bacteria. The Knoxville group suggests this science could be harnessed to create plants for the home that change color if they detect a drop in air quality — due to mold spores, or even radioactive radon gas. The authors have performed no research as yet, and merely present these ideas as theoretical. But engineers at MIT in Cambridge, MA, are testing yet another way plants could earn their keep around the house. The group successfully embedded specialized nanoparticles called luciferase into leafy greens like three-week-old watercress plants. Luciferase is what fireflies use to produce their light. 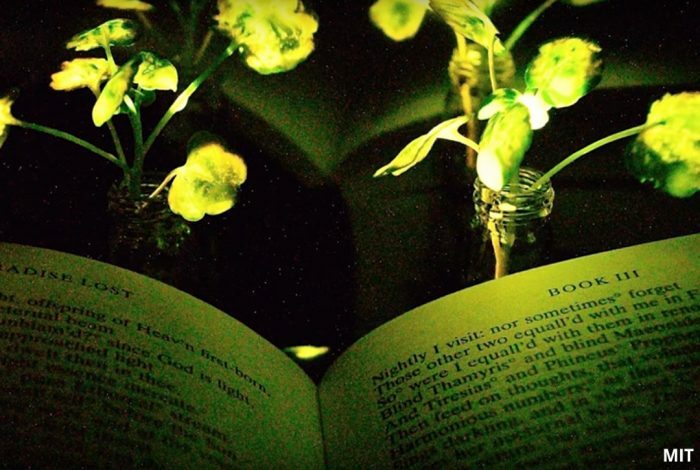 The nanoparticle-infused leaves glowed for around four hours. The research is at an extremely early stage, and the light given off is nowhere near enough to be useful. But the plan is to refine the technique until it creates plants you can read a book by in the dead of night. This is all well and good — proposing genetically modified “houseplant robots” that stay indoors and are hermetically sealed from the outside world. But what side effects might there be if this kind of science were let loose on the world? Allumen, a startup company based in Denmark, has plans doing just that. The company’s founder got an idea at a music festival. He “brought 55 liters of glowing algae to Roskilde [Denmark] Festival in 2017,” and after seeing how engaged and excited his fellow festival-goers were, he decided to try and monetize this excitement. The company is now researching how to genetically splice the glowing algae into trees. It hopes these glowing trees could eventually take over the job of street lighting — slashing towns’ CO2 emissions and saving taxpayers money. At what cost to the environment, however? Will the seeds from these genetically modified plants wreak havoc on local biospheres? Will glowing trees further confuse birds who struggle with nighttime lighting as it is? There are no answers as yet, and — as this science is a long way away from affecting our daily lives — there is plenty of time to conduct research and further analyze what effect this new side to genetic engineering will have on humans, animals, and plant life. Watch these two videos to learn more. Related front page panorama photo credit: Adapted by WhoWhatWhy from lightbulb (PIRO4D / Pixabay – CC0 1.0).